Here is a nice 3 bedroom 2 bath one level home with open living areas. Vaulted ceilings in the kitchen and family room add a certain ambience. It may cost a little more to build a one story house than a two story house of the same size and quality, but one story homes have advantages in that they look larger and have good curb appeal. Also, not having stairs gives you more usable square footage and should save you money on construction costs. A one level home also allows for better mobility for those who have difficulty navigating stairs. 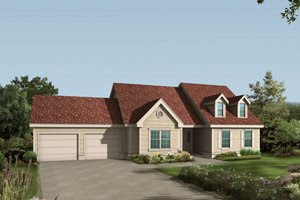 This appealing 3 bedroom ranch with attractive front dormers and an Optional Unfinished Basement is from houseplansandmore.com. 2-car front entry garage: 510 sq. ft. Optional Unfinished Basement: 1642 sq. ft. Concrete Patio: 100 sq. ft.
To estimate the cost, I’ll use the FREE cost to build calculator found on my Getting Started page. So, using ”Class 5, Average Standard Quality” on the cost to build calculator for the Appleton, WI area, Zip code 54911, I came up with a cost to build of $257,721 including a General Contractor Markup of $30,825. That’s an approximate cost of $157 per sq. ft. Important Notice: Cost estimates change with time. YOU can update this 2019 estimate to see if it has, as well as experimenting with different building quality inputs that affect the cost to build by using this cost estimating software. Keep in mind that all these estimates are approximate and are just a guide. Until you actually start getting your own bids and estimates and entering them into your own spreadsheet (see my spreadsheet page for FREE spreadsheets), they will remain approximate.